Experience the beauty and tranquility of Wisconsin's Northwoods while staying at this cozy Minocqua hotel overlooking Lake Minocqua and near hiking, biking, skiing and more! Situated in downtown Minocqua on Highway 51 and across from Torpy Park, the Best Western Plus Concord Inn makes it easy to experience all that the area has to offer. Spend your summer days water skiing, boating and fishing on sparkling Lake Minocqua, or enjoying the nearby golf course, Frisbee Disc course and zipline. In the winter, partake in snowmobiling, Nordic skiing, snow shoeing and pond hockey. Just a short walk away from this Minocqua hotel, Bearskin State Trail along Bearskin Creek offers multiple fishing, hunting, hiking and biking options. (Be sure to ask our friendly staff about sports equipment rentals!) And for even more family fun, visit the hands-on Wildwood Wildlife Park, just three miles away. This Minocqua hotel is just a stroll away from many downtown shops, bars and restaurants. Corporate travelers appreciate being near local business attractions, such as the Marshfield Clinic, the Howard Young Medical Center, and multiple offices for real estate and banking. The Best Western Plus Concord Inn is also perfect for experiencing one of the area's many annual events, such as the Beef-A-Rama, Tomahawk Fall Harley Ride, Summer Thunder, Cruiserfest and Fourth of July. 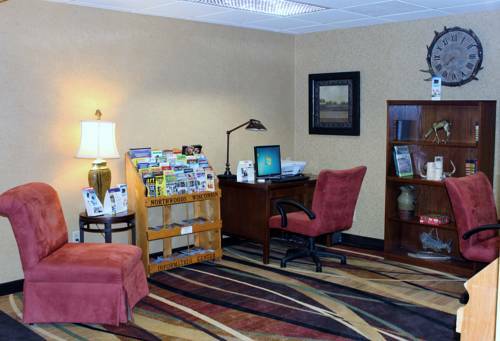 Make yourself at home at this Northern Wisconsin Best Western hotel, known for its cleanliness and friendly and professional staff. Hotel amenities include a complimentary full hot breakfast and a heated indoor pool and whirlpool. The Best Western Plus Concord Inn is also the only hotel in town with a lounge - our guests are invited to relax at the end of a busy day at Revere's Lounge, featuring two-for-one drink specials for hotel guests. Pack your bags and head north for your stay at the Best Western Plus Concord Inn in Minocqua, Wisconsin. Book today and save! Enjoy your stay. From: South Take highway 51 North to Minocqua, 0.4 miles north of bridge to the Best Western Plus Concord Inn on the left. From: North Take highway 51 South to Minocqua. The Best Western Plus Concord Inn is on your left 0.05 miles from downtown area. 0.1 mile(s) from Loon Land Trading Co, gallery of fine wood products, pottery, etc. 0.1 mile(s) from Whoops & Co.